As both a personality and an artist Charles Demuth was multifaceted, an adventurous American modernist who was part of the artistic and literary avant-garde in New York and Paris in the teens and twenties while remaining a lifelong resident of the small town of Lancaster, Pennsylvania, where his family had been solidly established since 1770. After studying art in Philadelphia for some years, Demuth lived in Paris in 1912-14, when Cubism became a major influence on his slowly maturing style. 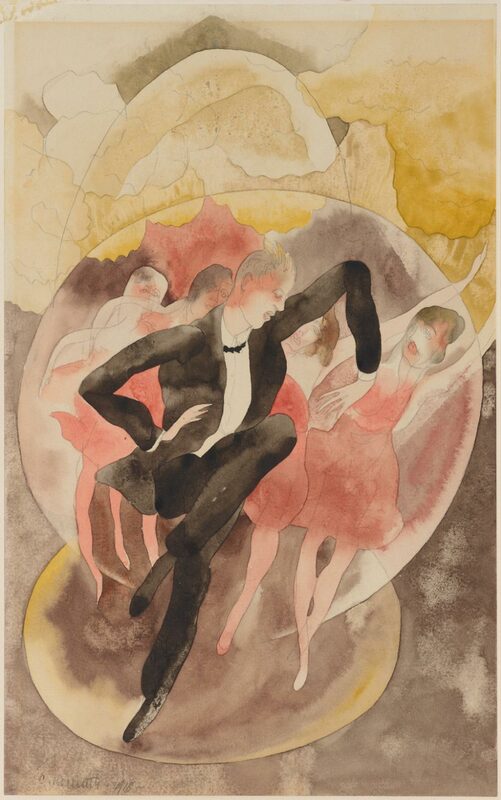 He was at his most creative between 1915 and 1919, during which time he produced this and a number of other watercolors inspired by his beloved circus and vaudeville performances. In these works Demuth uses a watercolor technique that combines intense yet subtle coloring with supple pencil lines overlaid with transparent washes to achieve a Cubist flattening and segmenting of space. European in his stylistic inspirations, the artist nonetheless strove for a genuinely American vernacular expression that is summarized in these vaudeville watercolors as well as his architectural abstractions done primarily in Lancaster. Ann Percy, from Philadelphia Museum of Art: Handbook of the Collections (1995), p. 239.